It is morning in the wild west. As Eagle Eye Emma wakes up, she realizes, that her husband never came home the night before. Did something happen to him? No. But something is about to happen to him, because he just spend the night with Long Legged Lucy, and Emma does not like that one bit. Now they are both on Emma's bad side. You do not want to be on Emma's bad side. Now you must shoot your way to justice with Eagle Eye Emma in this wild, western adventure! 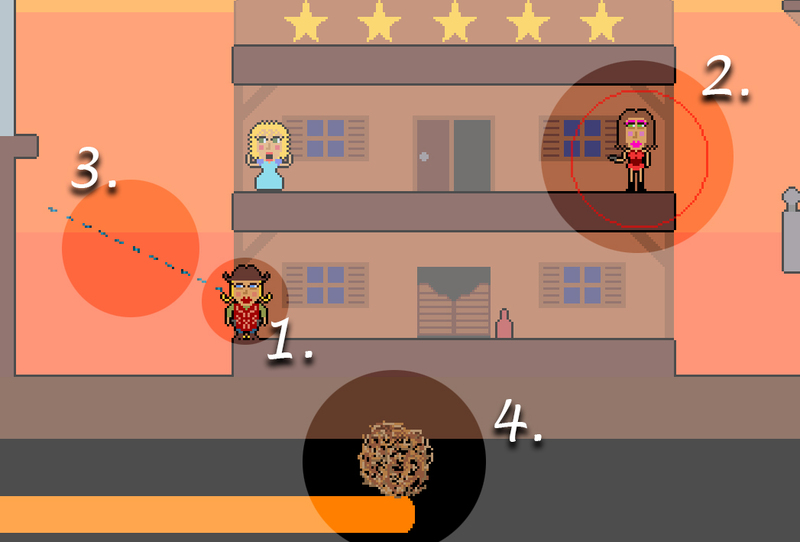 Eagle Eye Emma was developed during the 24th gm(48) game jam. It earned 7th place. The theme of the jam was One Shot. Make Masterful Shots with Simple Controls! Each of the game's three, unique levels place you at a fixed position (1.) in a good, old stand-off. Your targets will be marked with red circles (2. ), you will be aided with an aim-guide (3. 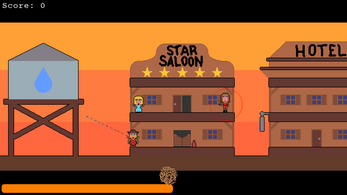 ), and a countdown tumbleweed will appear on the bottom of the screen (4.). Your goal is to fire a shot, before the countdown reaches zero, and ricochet your bullet across the room to hit your targets. You get points depending on how many ricochets you make, what you hit, and how fast you shoot. If you fail to hit a target, or if you are too slow to shoot, the targets will shoot you - so be fast! You aim and shoot with the mouse. You can mute/un-mute the audio by pressing "M". The first place of the official high-scores from the jam (you can find them on the jam page) came in at 3274 points - see if you can beat that! If you download and play the Post-Jam Edition we have made a few minor changes based on the feedback from the jam. The bullet can no longer ricochet an unlimited number of times (to avoid infinite loops), yet still plenty of times to rake in a high score. Also changes has been made to stop the bullet from getting stuck in characters.